So being a Marvel fan, I caught the movie on the day it released in India. Dr Hank Pym (Michael Douglas) has discovered that his protege has been trying to steal his technology. Hank gets fired. Just like that. 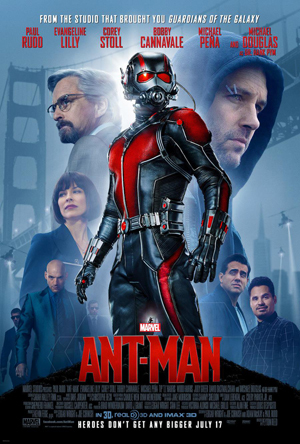 Enter Scott Lang (Paul Rudd), a 'reformed' cat burgler just out from jail and looking for a clean break. I won't give away the rest of the movie but I guess you already know where this is headed. Paul Rudd is a fabulous comedian and is in a league of his own. Michael Douglas has aged fabulously. Michael Pena has comedic timing. The good thing about Marvel movies is the continuity and the way all the other movies are connected with eachother. The bad thing are the intermittent references to Iron Man/Tony Stark. Well, I won't blame them because if something works really well, why not piggy back on it. The VFX is good, as usual. There is a fair amount of geek-speak so that will appeal to the geek in you. Intrigue? Strip this movie for all its tech wizardry and it is just another movie where an over-ambitious co-worker steals your tech (because he wants to take over the world) and fights you in the end and dies. Sounds familiar? Sure, if you are a Marvel fan. Its a nice outing with friends on a lazy evening. While humor will keep you yawn-free, it would have been better if there was a better storyline. I do see the potential for a sequel but so are most of the other Marvel superheros. Ant Man is here to stay, atleast for a while.